I begged. Three people felt compelled listened. And I love each one of you with all my heart. Truly. Maybe begging was the wrong tactic. You know I’m opposed to bullying. How do I get folks to sign up for my newsletter then. Contests: The only contests I’ve run on my blog have FAILED to get entries. I either give crummy prizes, or no one sees the contests. Pop-Ups: This feels like bamboozling to me. I don’t appreciate pop-ups when I visit sites, so why would I force my visitors to suffer through them? E-mails: Uh, I don’t have any email addresses on my list. That’s why I’m in this situation. Twitter: There’s a way to see if people ever come to my blog because of Tweets, but I’m guessing since I don’t have much of a following over there, it’s as ineffective as begging on my blog. Facebook: Yeah. My posts show up on Facebook. A few of my friends click through if the topic looks interesting. That’s a place to build relationships, not try to coerce people into something. Experts say if I have offer my readers something of value to sign up, that will motivate them. Question: What do I have of value to offer other than my writing? Experts say that I need to write compelling content. Duh. Experts say once I write something compelling, I need to make it easy to share. Question: I have all the share buttons on my posts. How can I make it any easier? Experts say if I visit other blogs with a similar topic to mine and comment regularly, other readers will see my comment and hop over to check me out. The topics I address aren’t interesting to my readers. I write about too many different subjects on this blog. I need to find my niche. I’d rather be writing my fiction or Bible studies than thinking up things to write about on this blog. The posts that I feel will have the greatest reach fall flat. When I visited a Facebook party, I had the most hits on my blog. So, people were checking me out based on how I commented there. Since that time, I’ve tried to repeat those results – no success. I’m floundering. I’m in over my head. I need to face the fact that I’m not going to build an email list (thus, publishers are going to reject me for having no platform). Why does this writing thing have to have more legs than an octapi family reunion? Your thoughts could help me with this dilemma. If you are reading this post, please help me. What can I do to interest people in signing up for my newsletter? Okay, I didn’t take a survey. I don’t have any fancy algorithms in place. These are the five blogs that have become my “go to” blogs for writing advice and inspiration. If you want to laugh, you need to click on this link and follow this blog. Even if you don’t give a whit about writing, Kristen is hilarious. Besides being great with words, she has sound advice about building an author platform. WANA is Kristen’s “baby” (literally. This is why she’s affectionately called the “WANA Mama) and she cares about writers. I know this because she critiques a story of mine just because I complained about the difficulty in getting honest feedback in the comments section for one of her blogs. I tend to have a love/hate relationship with Kristen (but it’s mostly love). After all, she told me to dump my series. I had to start completely over when I was two-thirds done with the rewrite of the first book and about one-quarter of the way into the first draft of the second book. Sure, she helped me come up with plot ideas for the new series. She even made me laugh when I really wanted to cry (did that after I hung up the phone). The bottom line is that she wants to help every author who is serious about their craft. Jami’s a goldmine of information on structure, craft and the publishing world. Additionally, she’s a great instructor and believes in the WANA Way – authors helping authors. I love her beat sheet template and have raved about it in other posts. Check it out here. While you’re there, subscribe to the blog. You won’t be sorry. Aside from loving Weiland’s book, Dreamlander, I first found her through a free download she offered. It’s an excellent booklet about creating realistic and relatable characters. I don’t read every blog. I do subscribe to her newsletter and return to read the blogs that pique my interest. This is another writer who donates time and effort to helping other writers succeed. If you’re looking for practical advice on how to write query letters and other specific topics, look no further. Just follow Nathan. Nathan was an author agent in his previous life. Now he writes middle grade fiction. His blog makes me smile. I feel like he’s talking directly to me. Okay, really I check out the whole website more than any particular blog. I do find the information that Brian Klems shares interesting and engaging. This blog is updated on a daily basis, so I don’t read every post. If it doesn’t sound like something I care about at that moment, I know I can easily find it later with a website search. Their general blog is probably where you’ll find the widest range of information on craft, publishing, conferences, finding an agent or anything else that comes to mind. Are there other blogs that help you as a writer? Share the wealth, my friend. Before anyone has a complete conniption fit, this post is a fiction submission to the entertaining series promoted on Don Charisma’s blog. It’s an exercise in writing improvisation. I was given a topic and had to create a post. My topic “Dinosaurs were invented by the CIA to discourage time travel.” I formulated the following press release after doing some research on the founding of the CIA and notable discoveries of dinosaurs in the United States. FOR IMMEDIATE RELEASE (January 2014) – In her grandfather’s biography, historian Jenny Ontspot reveals the truth behind the creation of the Central intelligence Agency: time travel. The book, Cradle of the CIA, is based on the life of her grandfather John O. Eastwood, Deputy Director to Roscoe Hillenkoetter, the first Director of Central Intelligence (DCI). Ontspot formulates her conclusions and findings on documents (2,641 pages) recently discovered at Eastwood’s estate. In the chapter entitled: “Dinosaurs: the CIA’s biggest secret,” Ontspot explains and supports these allegations. While supposed bones of dinosaurs had been discovered as early as the 1850s in the United States, the true craze erupted after Edwin H. Colbert made his New Mexican find in 1947. According to Eastwood, Colbert was an early CIA operative, and the artifacts he discovered were clever creations manufactured by scientists, employees of the government. This claim has caused quite an uproar in the scientific community, with renowned paleontologists landing on both sides of the fence. Were dinosaurs an elaborate ruse buried in rock by the CIA? Ontspot answers the inevitable query of why such an auspicious agency would go to such lengths. Time travel. History reports that the DCI informed Congress the USSR was close to duplicating the atomic bomb. The real intelligence was the discovery of a working time machine. “If the Russians are allowed to travel through time and alter history, all will be lost,” says a report by Agent X. When the device was secreted out of the USSR, it was taken to a testing site in the US. Scientists experimented and collected data, much of which is shared in the book. “On multiple occasions, scientists transported objects and animals ten minutes into the future,” reported Agent Y. As exciting as this was, a clear and present danger presented itself with successful travel into the past. After an extensive search (sixteen pages in triplicate), a volunteer was appropriated. He allowed the scientists to send him 50 years into the past. His instructions: find a dated artifact to verify your arrival, secure it, and return. On March 5, 1947, the time traveler arrived with a front page from an 1897 copy of the San Francisco Alta California. Perplexed and horrified, a study team spent ten days discussing ways to prohibit time travel. Some of their ideas have been employed in more recent years, as discussed in other chapters of Ontspot’s book. The diversionary tactic they determined to pursue in March 1947: create a beast so terrifying that mankind would fear encountering it, and thus abandon all attempts at time travel. 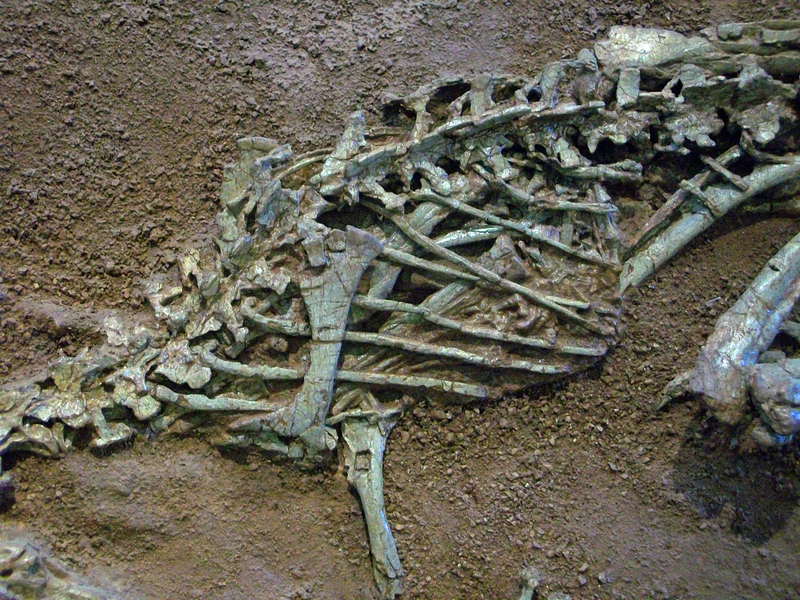 The first step in their convoluted scheme involved fabricating a radical find of multiple complete dinosaur skeletons in New Mexico. These were found 351 miles from the secret Area 51 by Agent Colbert. After all, Area 51 was designed by Eastwood’s boss, Director Hillenkoetter, who made well-documented assertions that UFOs existed. Other documents reveal this same Agent Z verified the security of said site on several occasions. Ontspot speculates it could be within Area 51 or more likely buried under nuclear test sites with the radioactive byproducts of those warheads. To get the full scoop, pick up your copy of this newly released certain to be bestseller. Cradle of the CIA is available at your local retailer or online at Amazon.com. Some of this article is based in fact. Colbert did discover a collection of dinosaurs in the summer of 1947 near Albuquerque, NM. Hillenkoetter was the first Director of Central Intelligence and did argue to Congress that the USSR was close to making an atomic bomb. He is also on record for supporting the existence of UFOs. The 1897 newspaper company did, in fact, exist. All other names, titles and assertions are creative property of the incredible imagination of Sharon Hughson. One of the blogs I follow faithfully has been addressing the subject of bullying. It seems like bullies come out of the woodwork in digital areas like social media and blogs. In recent years, bullying has been a huge subject in the news. Numerous teenage suicides have been attributed to bullying. It isn’t just peer bullying either; some of the most atrocious bullying has been teachers to students. We tend to think bullying is something kids do. Everyone has to learn to deal with the bullies. Eventually, they grow up and the vile need to put others down or make them look bad disappears. This isn’t the case. Bullies just get older. They feel empowered to continue their hideous behavior because no one has managed to stop them or convince them of the error of their ways. They up the stakes and suddenly stealing lunch money from the nerd down the street isn’t meeting their need for excitement or validation. Their need for – whatever it is that motivates them to bully. You can read about one woman’s experience at work here. Can anyone believe that an employer would let such behavior go on unchecked? Maybe if it was the owner who was acting this way, but it wasn’t. One woman ruined a company and caused many people to lose their jobs. One bully. If one bully can make a fracas, what happens if one ally steps into the fray? In another post, Kristen Lamb shares some scientific data that indicates bullying behaviors can be stopped. How? Stop feeding the bully. No, I’m not advocating physical starvation. However, some genetic qualities surface because of reactions in the brain that simulate pleasure or satisfaction become associated with these qualities. Behaviors like bullying and aggression are two such characteristics. He was in sixth grade, entering middle school. Before school and after school while waiting for the bus, he played catch with some boys. A few 8th graders decided to have a little fun with this scrawny little jock-wanna-be. He came home covered in mud, with his shirt ripped off, with his hood dangling from his hooded sweatshirt and his backpack straps snapped in two. You can bet Mama Bear was on top of that. Those bullies would be sorry – if they could still breathe when I finished with them. My son told me not to contact the school or their parents. He wanted to deal with it. He laughed along with their pushing and shoving. He shrugged and submitted, pretending it was all in good fun. They couldn’t get his goat. They couldn’t make him cry. He wouldn’t shove back or try to get them to stop. Suddenly, it wasn’t fun for them anymore and they stopped. It took about three months for this resolution. My son wrote a few stories about bullies for language arts assignments during this time. He maintained excellent grades and continued to participate in sports and other extracurricular activities. I won’t say I didn’t bite my nails during this time or that my blood didn’t boil when another item of ripped clothing came home – courtesy of the bullies. I will say that my son handled the situation in the way he determined was best. At 12, he understood that if he didn’t give the bullies what they wanted – a scared crybaby or whiny tattletale – they would leave him alone. That’s the essence of the scientific data. We can starve bullies of their satisfaction. Don’t engage them. Stand up as a unified front against them. I don’t have the patience that my son displayed at 12. (He obviously inherited that trait from his father.) I prefer to be the change. I would rather step in and stand beside the person being bullied. I’m the one who got her face pounded in for telling the bully to stop. I’m also the one who got spanked in the principal’s office for smiting the bully in the mouth when they spouted off filthy lies. In either case, I am not someone who can be a bystander. Injustice infuriates me. People picking on the little guy because he’s defenseless ignites a fire of ferocity under my feet. What do you think? What’s the cure for bullying? Can a regular girl like me (or you) stop a big, bad bully in their tracks? This award was a happy Monday morning for me last week. I know it seems like maybe I wasn’t that excited since I waited to post this huge and hearty “THANK YOU” to Zehira-blog until now. Once you see all the requirements, perhaps you’ll forgive me. The Liebster Award is very unique in the fact it brings recognition to the smaller blogs of the ‘verse. With that in mind, all of the nominated blogs will have less than 200 followers. 2. Post 11 facts about yourself, answer the 11 questions you were asked and create 11 questions for your nominees. 3. Nominate 11 blogs who you feel deserve to be noticed and leave a comment on their blog letting them know they have been chosen. 5. No tag back thingys. I dream I live in an isolated cabin on Mt. Hood with a horse and a bobcat. Spiders make me scream. Fruit pie and ice cream is my idea of a decadent breakfast. I’m a closet “cat lady.” I wanted to be an FBI agent when I was 12. I think exercise is the best drug in the world. My favorite place to be is at home. I could totally win Survivor, but I’d rather be on The Amazing Race. I am two inches shorter now than I was at 18. I despise wearing shoes. My hands and feet are perennially icy. (1) Which famous people living or dead would you invite to your fantasy dinner party? Mark Twain, Abraham Lincoln, John F. Kennedy, C.S. Lewis, Rick Riordan and Kristen Lamb would be present at the phenomenal dinner party and I would happily hang on every word they said. (2) What is your favorite topic to Blog about? I really enjoy blogging about my family, writing and the struggles I have balancing work, school, family and writing. (3) Do you have any guilty pleasures? The only one I can mention to all of cyber space is dark chocolate truffles. (5) Who would play you in a movie version of your life? Duh – Jennifer Aniston. Apparently, I have her eyebrows (says an esthetician who shaped them for me). (6) If you were to write collaboratively with any author, who would it be and why? This is extremely difficult. I adore Rick Riordan’s writing voice and since he writes YA fantasy, he could really help me. Since C.S. Lewis is unavailable, I’m going with Mr. Riordan. (7) Is the glass half empty or half full? Half-empty when it’s that thick fiber drink, but half-full the rest of the time. (11) If you could be an animal for a day, what animal would you be? I would be a black panther. I would sleep in the sun and then climb high in a tree and sleep there. Sleeping in the sun is my favorite pastime. Now all of you nominees of mine, these are the questions you will answer when you “pay it forward” and award some other little-known blogs. If you were a book, what genre would you be? If you were a book, who is your author? Where in the world would you travel if time and money were unlimited? What is your favorite flavor of ice cream (please don’t say vanilla!)? Name the teacher that most deeply affected your life. Do you prefer it warm or cool in the room when you sleep?